Saving Spalding Pets: AO6-3106 DSH BLACK/WHITE-PREGNANT! RESCUE ONLY! Try as I might, I just could not get a decent picture of this pretty mom-to-be. She did hiss at me just a bit (who can blame her? pregnant? in a kill shelter? ), but calmed down soon enough. 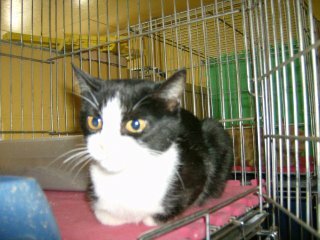 She is one of several cats surrendered by the same owner. She is available NOW to RESCUE and her LAST DAY ALIVE IS OCTOBER 30.